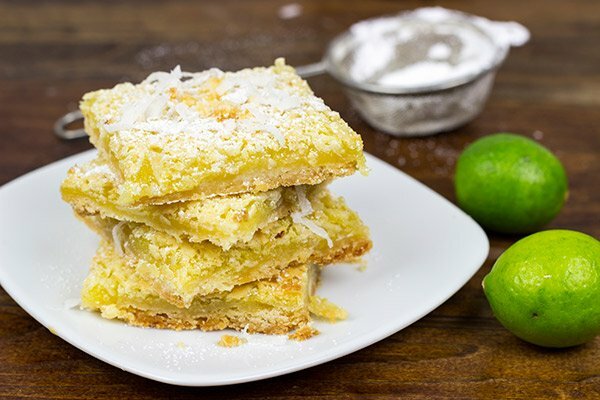 These Key Lime Coconut Bars are loaded with bright, tropical flavors…and they make for one heck of a delicious summer dessert! Here we are. Smack in the middle of the dog days of summer. Contrary to popular opinion, it actually does get pretty hot here in upstate New York. Granted, maybe it’s not the “melt the bottom of your shoes” heat that I’m used to from my days in Louisiana and Atlanta. And sure, the heat only lasts for a couple of weeks before we head off into Fall temperatures. But that’s ok…I’ve been soaking in this July heat and loving it! Oh, and what exactly are the dog days of summer? I know my dogs don’t really enjoy the super hot days. I’m sure I could search the interwebs for an answer, but I find it more fun to just guess at the meaning! Speaking of summer fun, there’s something about the heat that just makes me crave tropical flavors. 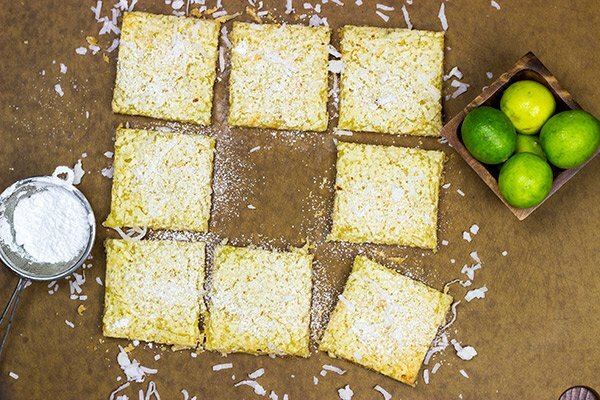 Say hello to these Key Lime Coconut Bars! 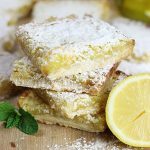 These citrus-y treats are one of my latest dessert addictions, and they’re the perfect sweet treat to enjoy at the end of a hot summer day. Earlier this summer, I made this delicious Classic Key Lime Pie. While I was standing in the kitchen squeezing these tiny little Key limes, it made me wonder why we don’t use Key limes more often. 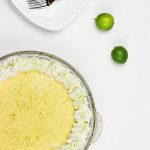 Don’t get me wrong, the Key Lime Pie is a summer staple, and deservedly so…but we need to share the Key lime love with other summer desserts! That’s when it hit me. What if I take my Lemon Coconut Bars, and just replace the lemon with Key lime? I filed this way in the corner of my brain labeled “Do This Later.” (That corner of my brain is getting kinda cluttered lately…does anyone else have this problem?) Well, later arrived and so did these Key Lime Coconut Bars. And woah are they delicious! Preheat oven to 350°F and grease an 8" square baking pan. In a medium bowl, combine the flour and powdered sugar with melted butter. Mix until well combined. Press into the bottom of the 8" pan. Bake for 20 minutes at 350°F. Meanwhile, mix the remaining ingredients (sugar, baking powder, eggs, key lime juice, key lime zest and coconut) in a medium bowl. 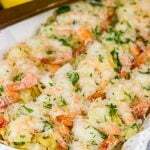 Once baked, remove crust from the oven and pour the key lime mixture on top. Bake for another 25 minutes. Chill before slicing. Garnish with powdered sugar just before serving. 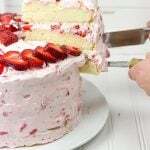 I love that they are thin ~ yummy! P.S. I agree with you about the sleep. I wake up early every day…but I swear I need more sleep. I think my body clock is out of batteries. I’m 100% allergic to all forms of coconut, but I love you anyway because you’re fabulous and threw my favorite lime flavor in with these bars… that I can’t eat…. Where’s my Epi Pen?! Wait, all forms of coconut? There’s more than one kind of coconut? 🙂 I’m sorry you can’t enjoy these delicious treats, Becca…but if you aren’t going to eat yours, then can I have it? No, Mr. Nutty, I mean all forms, as in the coconut meat, the milk, the extract, the flour, and the gosh darned shell even makes me break out in hives when I touch it. Hahahaha…it’s on, Becca, it’s on! Maybe I will be the FIRST to break into the “Put the Lime in the Coconut” song?!! But seriously, I have read recently that mixing Lime and Coconut has cancer-fighting abilities! Wait, so I can eat these Key Lime Coconut Bars for dessert AND fight cancer at the same time? Sign me up for that one! “You put the lime in the coconut and drink it all up…” <--- thanks a lot for that one, SueAnn! 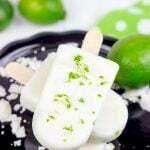 I have seen so many recipes for different types of key lime stuff recently – it must be because it is summer. But I have still not had key lime pie before. 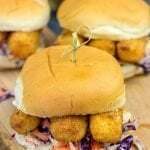 I need to try it! Funny, I always wonder where these saying come from. I know my dog isn’t liking the heat. Minute the door opens she bolts in and plops herself on the cool wood floor. Although we have been cooler than past few days, maybe fall isn’t too far away. Either way I love this recipe. 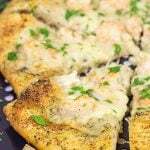 Key lime and coconut sound amazing. Yeah I think Fall is starting to creep around slowly here…we hit mid-50’s here last night! I can still use a couple more weeks of summer, though! 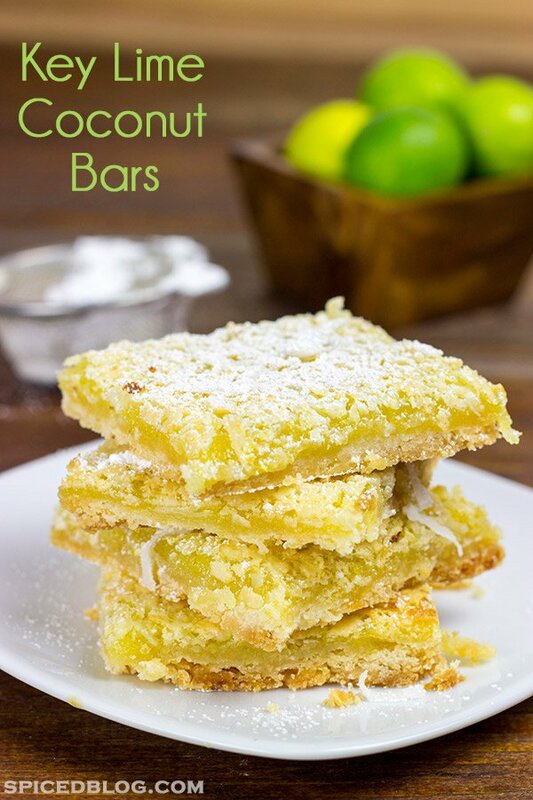 Key lime and coconut bars don’t sound so appetizing in the middle of the winter! Lemon bars are one of my favorites, too, Terra! But now these key lime + coconut ones are putting up a good fight. That batch didn’t last long in our house!! David, these keys lime bars look amazing. I’ll have to give them a try sometime this week. Thanks for sharing! Thanks so much, Loubna! These bars never seen to last too long around my house when I make ’em. Haha!! I hope you enjoy!